Split chicken breasts are one of the hardest meats to grill properly. Grilling with direct heat is the best technique for thinner, boneless cuts of meat because the heat cooks the meat all the way through quickly. The bones in split chicken breasts absorb some of that heat, so it's a little harder to cook the chicken all the way through without drying the outer breast meat. The other challenge is that chicken skin has a lot of fat and we all know what fat does when it drips onto the burner shields. A good squirt bottle with water and a watchful eye is all you need to combat that challenge. By the way, squirting down flare ups is great fun for kids. Put them on a chair at a safe distance and give them the squirt bottle and you've got a grill fire brigade. Although they are a challenge to cook properly, split chicken breasts are also a little more forgiving if you get the heat too high for too long. The worst thing that usually happens is a burnt skin and/or underside (bones). Some would argue that charred chicken skin is a delicacy, which by the way is a great excuse for the next time you burn that skin! 2Preheat one half of your grill on high heat and the other half on medium-low. Note, temperatures and times vary greatly because every grill is different! 3Once the grill is properly heated, place the chicken breasts skin side down on the high heat side. This is where you want to have your squirt bottle and a watchful eye to knock down your flare-ups. 4Grill the breasts skin side down for about 4 - 5 minutes with the lid open, you are mainly browning the skin in this step. 5Using tongs, move the chicken breasts over to the cooler side of the grill and keep them skin side down. 6Grill on the cooler side for about 6 - 7 minutes with the lid closed. 7Open the lid and use your tongs to turn the chicken breasts over and move them back over to the hot side of the grill. 8Cook the split chicken breasts bone side down on the high heat side of the grill for about 6 - 7 minutes with the lid open. 9Using tongs, move the chicken back over to the cooler side of the grill and continue to grill bone side down for about 6 - 7 minutes longer with the lid closed. 10If you are new to this, you may want to use an instant read meat thermometer to test the breasts. Shove that baby into the thickest part of the breast (without hitting a bone) and check for 160 degrees. 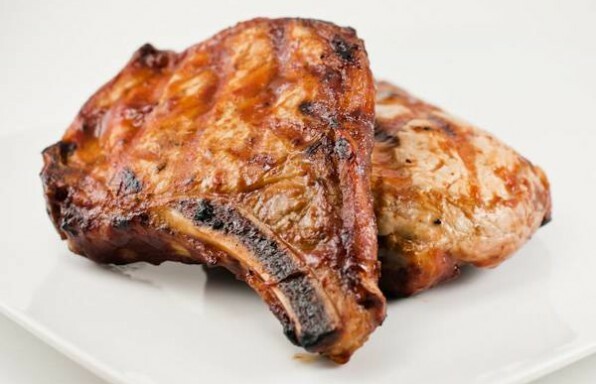 If they need to cook longer, leave them on the cooler side of the grill with the bone side down and close the lid. Check them again every 6 minutes or so until done. 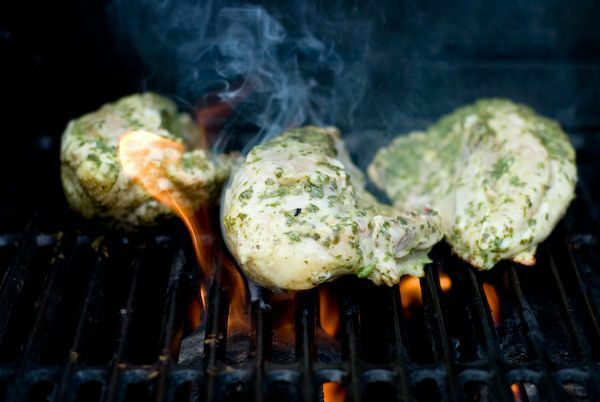 11Remove the chicken from the grill, place on a plate and let the breasts rest for about 5 - 8 minutes before serving. 12It may take a few experiments but once you get the technique down you will have a nice brown crunchy skin covering some delicious and juicy breast meat. If the skin gets burned a little, who cares? Peel the burnt skin off or cover them with some sauce and throw them back on the grill for a few minutes, making a glaze for what you claim you were planning on cooking in the first place, barbeque chicken! This is a perfect method for grilling chicken breasts, moist and juicy every time. I brined them last time in a salt and sugar brine and then grilled according to your instructions, perfect. Almost perfect! I just needed a few more minutes on the rib side. So nice to have a method that works!! tried this tonight. Have to say it turned out great, everyone loved it. This recipe is so easy and results in the best grilled chicken! True that each grill temp can differ. Use the thermometer to get to 160 degrees F. The chicken is very moist and looks picture perfect. The last round on the lower heat side, I use a squirt bottle with Trader Joes Organic Hickory BBQ sauce, drizzle then brush on the skin side. Wow! Adds the pop of bbq flavor that is outstanding! Best bone in chicken I’ve ever cooked! Great technique and easy to do. Excellent with any favorite marinade. Worked fabulously. I brined the chicken first. Do not have high/low areas of the grill so manually turned down/up the heat. Also put a rub under the skin. We had a bit too much char on the skin (assume the heat was a bit too high on the “hot” side), but even with that, the meat was tender, juicy and perfect. Thanks for helping an amateur griller get it right! I like that you shared this technique. Only criticism I might make would be; instead of resting on a plate rest in a makeshift foil bag or on a cooling rack under a foil tent. This is great for picking (hand shredding) the chicken for tacos, salads, etc. So I followed the instructions to a T. First time chicken breast griller and they came out great! Thanks for posting! Worked perfectly, had to add 6 extra minutes at the end. Thank you!! I have book marked this page. This worked perfectly for us! I did have to add the extra 6 minutes at the end (all grills are different!) I love chicken juicy and this made everyone in the family happy (they accuse me of undercooking chicken to get it juciy!) Thank You! Worked perfectly! As you mentioned, every grill different and I had to use the extra 6 minutes at the end. I love chicken juicy and this technique is perfect! Thank you! I’ve used this method 5 times now and works awesome. I use a dry rub and let me tell you, it’s the best chicken I’ve ever grilled. Only issue is with a 3 burner grill you have to adjust the heat a bit but after a few times its like old hat. Right on the money. Wish I had read this before I started grilling, rather than after putting them on. Then I looked up how long to cook them, found this, and all was good!